1903 American director Edwin S. Porter, chief of production at the Edison studio, helped to shift film production toward narrative story telling, with such films as the first realistic (or documentary) story film Life of an American Fireman (1903) and the popular western tale The Great Train Robbery (1903). 1903 The Great Train Robbery (1903), one of the first westerns (filmed on the East Coast in New Jersey - not in Hollywood), was a 12-minute dramatic film. It was the first to use modern film techniques, such as multiple camera positions, filming out of sequence and later editing the scenes into their proper order. There were 14 scenes with parallel inter-cutting or cross-cutting between simultaneous events. It was also memorable for its audience-shocking scene (placed at the beginning or end) of a cowboy shooting his pistol. 1903 The first male movie star, and first Western star was Max Aronson, aka Bronco Billy, Max Anderson, and Gilbert M. Anderson, who made his first film appearance in The Great Train Robbery (1903), as a bandit, a passenger who was shot in the back, and a tenderfoot dancer. Also, the professional film stuntman was ex-US cavalryman Frank Hanaway who appeared in the film as one of the bandits. 1903 Edwin S. Porter's comedy shorts Rube and Mandy at Coney Island (1903) and A Romance of the Rail (1903) were noted for combining a story-line with a travelogue. 1903 The American Mutoscope & Biograph Company, the oldest movie company in America (founded in 1895), moved to a converted NYC brownstone on E. 14th Street, its first indoor studio. It was the first movie studio in the world to rely exclusively on artificial light. 1903 Hollywood was officially incorporated as a municipality. 1903 The Danish film Capital Execution (1903) (aka Henrettelsen) was the first feature film made by Denmark's film industry, which went on to thrive until the Great War. 1903 Thomas A. Edison brought a lawsuit (Edison v. Lubin) against rival competitor and producer Siegmund Lubin for copyright infringement. Many of Lubin's films were remakes, mimics or "dupes" of the movies Edison and Edwin S. Porter were making. At first, Lubin successfully defended himself by claiming that each frame, rather than each film, had to be submitted separately. On appeal, the court eventually declared that the frame-by-frame method of copyrighting was impractical, and so the lower court's ruling violated the intent of Congress. The judgment allowed a film to be copyrighted in its entirety by one copyright submission (instead of by each individual frame). 1903 Edwin S. Porter's (and the Edison Company) enterprising and ambitious adaptation of Harriet Beecher Stowe's familiar and popular novel Uncle Tom's Cabin (1903) was one of the earliest 'full-length' feature films (about 14 minutes!). The film reduced the 500-page novel down to 14 short sequences. 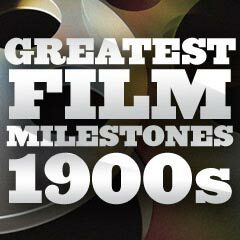 At the time, the Edison film catalog advertised that it was the first American film ever to include titles (called "announcements") to identify and introduce each new scene. The film pre-dated Porter's own The Great Train Robbery (1903) by about 3 months. Between 1903 and 1927, at least nine films titled Uncle Tom's Cabin were made in the US, making it the most-filmed story of the silent era.